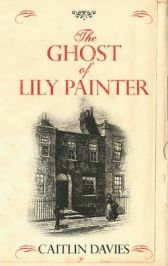 Despite its title, The Ghost of Lily Painter is not really a ghost story; there is a ghost and sections of the story are told from her viewpoint, but it is a story about the various people who have lived in the same house in Holloway, North London, over the years. In the present, Annie is determined to stay in the house she bought with her husband before they broke up, but doesn’t know financially how she is going to do it. Her day to day activities and worries are observed by the resident ghost, Lily. These include taking her young daughter Molly to auditions for various acting jobs. She starts researching the history of the house in the local library and uncovering its secrets. I found Annie as an impecunious middle class single mother quite easy to identify with, and I liked the portrayal of the mother-daughter relationship through the changes of Annie’s husband Ben moving out and Molly growing up, no longer being a small child, becoming her own, more independent person with ideas of her own. Then there are the strange ghostly happenings in the house. The most interesting story though was the one set in 1901, the turn of the century and the end of an era. Lily and her parents lodge with a policeman, Inspector William George and his family. His investigation into baby farmers, women who took in babies for money, often from mother who couldn’t keep them for reasons of money and/or the disgrace of illegitimacy, coincides horribly and tragically with the story of Lily Painter, and we learn why she is a restless ghost. Baby farmers often took a small lump sum to take in a baby, but wouldn’t keep them indefinitely, and babies were often allowed to die or deliberately murdered. Caitlin Davies draws on the true story of Amelia Sach and Annie Walters, who were hanged for baby farming in 2003. I found this story to be an absorbing read, drawing on a very sad piece of women’s history. I quite liked the idea of ghostly Lily watching Annie and her daughter, and other occupants of the house, though there was a point when Lily in the first person comments on Annie using her computer, and I wondered how Lily would know what the computer is – I was amused to be thinking about realism in a ghost story! All the characters seemed quite convincing and I was interested in reading about their lives. The plot is a bit weaker than the characterisation, particularly towards the end when its resolution and tying up involves far too many coincidences, and the story would have been complete and satisfying without at least one of the final revelations. However, I do like the way in which Annie’s research into the past helps her come to terms with her own present. I would recommend this book to anyone who likes stories about the links between past and present, and social/London/women’s history. The Ghost of Lily Painter was published by Hutchinson (Random House), in trade paperback in June 2011. I received a free review copy of this book through the Amazon Vine review program. No Comments on "The Ghost of Lily Painter"